The pace may have been a killer and we might have seen it all before BUT Affleck’s crime caper still packs a punch. The opening 20 minutes didn’t mess about. It set up Joe’s (Ben Affleck) past and got straight to business as he worked through the ranks from a petty thief to a bootlegger. Being a noir nut, I was always going to be a little biased. 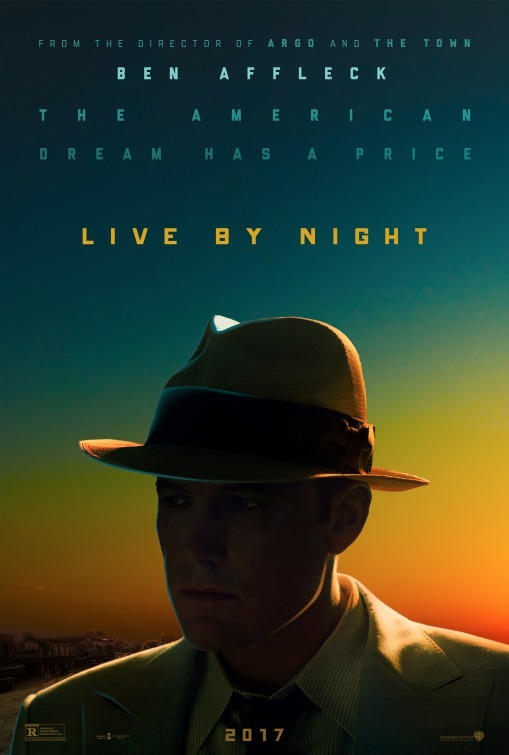 It helps when some of Affleck’s better works; The Town, Gone Baby Gone (and now Live By Night) are heavily influenced by that very genre. I’ve been impressed with Affleck’s transformation as a director. A maturity from his 90s blockbuster phase. And yes, I do think he will be a good Batman! Enough of these sad Affleck memes. It was everything I expected from an Affleck penned gangster flick. I was already ticking noir traits off my imaginary checklist; embittered war veteran (check), disillusioned with the law (check), falling for a girl that can only mean trouble (CHECK! CHECK! CHECK!). I say Affleck penned. He did have a little help from Dennis Lehane’s crime novel (Thank you @TheMarckoguy). A noir author I intend to read up on. A man that has penned such works as: Shutter Island, Mystic River and The Drop. I was engrossed in Joe’s game. Playing off the Irish against the Italians in their turf war. Just to get a piece of the action and stay out of the cross-hairs. BUT it wasn’t long before the protagonist had to make a choice. Always felt that Robert Glenister was a very underrated TV actor. Just watch BBC’s Hustle. I didn’t expect to see him feature as Albert White, the Irish kingpin. He was brilliant. I wish he was in this more. A callous adversary if ever there was one. A ticking time bomb. The fuse? A woman, of course. Sienna Miller (Foxcatcher) wasn’t in the film as much as I thought. Especially after all the interviews and heavy advertising. She delivered a good performance as the moxy Emma BUT somehow I think if she had more screen time with that strange Irish accent, she might have overstayed her welcome very quickly. Brendan Gleeson made a much more memorable impression as Joe’s father. A relief after his dire cameo in Assassin’s Creed (The less we say about that, the better). Sheesh. Another character I would have been happy to see more of. His fractious relationship with Joe was an interesting angle that wasn’t explored enough. A copper desperate to see his criminal son on the right path. “So you’re threatening me with people that are more powerful than you? So who am I talkin’ to you for?” Affleck was fantastic. Another powerhouse performance. He looked like a tank with that Bat bulk. The pace did meander in parts with the middle act taking the biscuit BUT thankfully that was relieved by cracking dialogue, great action pieces and fantastic cinematography. No, really. Robert Richardson’s cinematography was something else. The sweeping shots across Miami were breathtaking alone. The car chases were brilliantly shot. It felt like you were in the car with the robbers as they evaded capture. And of course, no gangster flick would be complete without bodies being bullet ridden by Tommy guns. I was a little disappointed with the female roles. Miller didn’t really come across as a strong femme fatale and Zoe Saldana (Guardians of the Galaxy) was completely wasted in her role. The pair had good chemistry BUT there just wasn’t enough drama. Affleck missed an opportunity for sparks to fly when an old friend from Joe’s past crept out of the woodwork. Shame. At first, I kept wondering why Elle Fanning (The Neon Demon) was reduced to such an unnecessary cameo as the sheriff’s daughter. However, there was an interesting turning point with her character that took me by surprise and allowed the actress her moment to shine. A good performance. Despite my niggles, Affleck perfectly captured a gritty criminal underworld full of rich and dark characters. Chris Cooper (American Beauty) played the holistic sheriff with aplomb. Happy to turn a blind eye on Joe’s “business affairs”. Appropriately calling him, “The Mayor of Evil”. The tense encounters with the KKK saved a labouring middle act. The suspense and heated exchanges soon brought me back into the fold. The only problem with a noir is that the end game is always the same. The fiery final act was worth the wait. Nail biting, gripping and action packed. Even if Affleck gave us umpteen false endings. Seriously, I kept thinking the film had finished. Only for something else to pop up. A little predictable, long at the tooth BUT tense, gritty and still a bloody good watch.